This cover offers great protection from the sun, bird droppings, extreme heat, fine dust, tree sap, snow and ice, industrial pollutants, dirt and uv rays. Backed with our 5 year warranty, this cover has been tested in the harshest of weather conditions. Our cover is made with a material that is breathable yet water resistant, which allows trapped moisture to evaporate. This allows air to circulate inside your boat while at the same time keeping water out. Other covers that do not have this characteristic can hold in moisture and cause mold, mildew and rust which can have devastating effects on a boats interior. Our cover is made with a soft, abrasion resistant material and stitched with rot proof thread. It has a reinforced sewn-in shock bungee cord for snugness and double stitched interlocked seams. We have included a storage bag made out of net, so there is no need to wait for the cover to dry. Being mildew resistant, water resistant, and having ultra violet screens, your cover won't break down or let the exterior elements in. The ultraviolet screens and light color also keep your interior cooler and protected, keeping it looking new. The fabric is resistant to sagging because the fibers are designed to have minimal stretch and will retain its original form throughout its life. 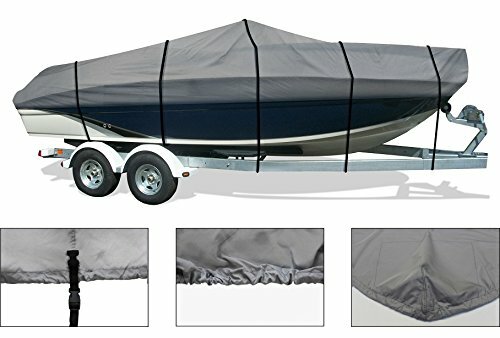 This is a deluxe cover meant to protect the nicest of boats for years to come. This is not a disposable cover. Please take the time to get the right one. If you have any questions about this product by Vehicore, contact us by completing and submitting the form below. If you are looking for a specif part number, please include it with your message.